I shouted my living room down !!! Wow I had truly been here before .... Praying for an answer and God was quite! My ohh my .... Did He show up when He seen my obedience to follow Him even into the unknown ! I did some cleaning out today .... Cleaned some closets up .... 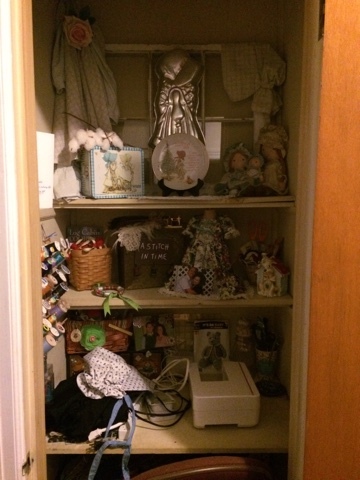 Turned a closet into a sewing area .... After I stood back and looked at the transformation .... It sent shivers up my spine when I felt my Dad whisper in my heart ! Just imagine the transformation I see in you when I look at you .... I knew then my prayers weren't going unheard or unanswered . He's teaching me something ..... I know He has my answer .... So I will praise Him in the Hallway !!! While I wait for His answer !!!!! I'm sure you know how I've needed this today! Its been a long waiting period for me, and its hard to wait and listen and be patient. I love you and thank you so much for sharing this today! I so needed it! Your so welcome !!! Still praying love you mostess !!!! Miss you so much !